Cold day. Hot food waiting for me. This is one of the reasons I look forward to fall and winter so much. 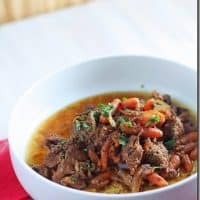 I use my slow cooker on average twice a week and it is so easy to get stuck in the chili-roast-stew rut. I can usually tell I’m stuck when Stephen grimaces after I get out the crock pot. I know he’s tired of the unholy trinity of crock-pot cooking. This is a recipe adapted from Everyday Paleo cookbook by Sarah Fragoso. I just didn’t have all the ingredients on hand so I had to improvise a little. 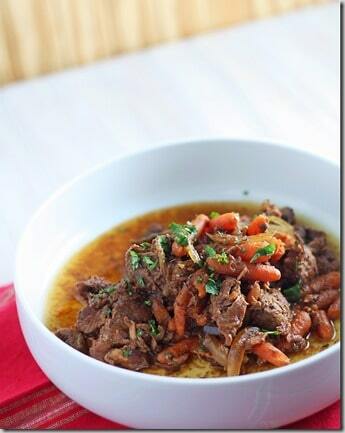 This is definitely Whole30 compliant and tastes fantastic. Add onions and carrots to bottom of crock. Layer beef on top. Pour can of chopped tomatoes with chilies over beef. In a medium bowl, whisk tomato paste, broth, spices, and salt and pepper. Pour over beef and vegetables.